Work Design Magazine, Swingspace, and WeWork conversations move forward with a discussion at our October 17th Atlanta event. Work Design Magazine’s Atlanta Panel (L/R) with publisher Bob Fox, Wendy Heller, Justin Guttman, Janet Simpson, Melissa Marsh, Zak Kidd and Lawrence Gellerstedt. Image courtesy of Savills Studley and Patrick Ward. On October 17, we continued our discussion on “The Changing Nature of Work and the Workplace”, convening at WeWork Tower Place in Atlanta’s Buckhead neighborhood. The robust dialogue energized our broad spectrum of attendees from Corporate Real Estate, A&D, and the furniture industry, which began at our previous events in Washington, D.C., Burbank, CA and Chicago, IL. Creatively moderated again by Zak Kidd, Co-founder & COO of SwingSpace, our panel included Wendy Heller, Senior Workplace Strategist at the Coca-Cola Company; Justin Guttman, Director of Sales at WeWork, Janet Simpson, President of tvs design; Melissa Marsh, Leading Workplace Strategy & Occupant Experience at Savills Studley, and Founder & Executive Director of PLASTARC; and Lawrence Gellerstedt, Director at Cushman & Wakefield, and the SE Leader of the Tech Practice Group. Although we have planned the discussion around the following questions, each iteration of the series has provoked conversations that vary from location to location, depending on focus and experiences of each panelist. What are the real benefits that companies are getting out of their workplace today? What is essential for businesses and leadership today? How can CEOs use their workplaces as tools to drive innovation in their organization? How does the workplace industry have the power to create space and set the conditions for change? According to Janet Simpson, “it all starts at the front door.” The message received upon entering a space is the first clue a visitor or potential employee gets about a company. Think about what you see: a sterile, white environment sends one message, while an open, bustling space sends another. How one feels and experiences the space sends a high signal about the company. This must be organic and should align with the businesses core DNA as those first impressions are essential. Melissa Marsh made the analogy that architecture and interior design is a physical manifestation of the company culture. She added that the physical design similar to a petri dish – depending on what’s in the mix, this can enhance, grow, and accelerate the development of corporate culture. Commenting on if design leads to innovation, Melissa noted that in today’s knowledge economy, productivity is contingent on the interaction between people. The workspace is the petri dish, and depending on the molecules in the petri dish – the more people, diversity, interaction, collaboration, and creativity can occur. 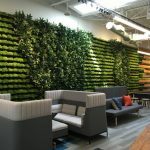 Wendy Heller continued the thought by describing how the recent upgrades to Coca Cola’s Atlanta HQ was a away to give their 130-year-old company a makeover that more clearly aligned with their brand. The previous space was not promoting their culture and did not reflect their spirit of optimism. It also did not work to develop community spaces for employees to come together across the business and make connections. The efforts to re-energize the company has allowed the campus to change in ways that are redefining how their employees and visitors interact. The Flip Disc Display at Coca Cola’s Atlanta Headquarters changes images every ten minutes. Image courtesy of Coca-Cola. Wendy went on to describe the big and small concrete changes that make a brand statement and create surprise and delight as you enter and move through space. Thinking back to Janet’s “it happens at the front door” comment, a welcoming space at the Coca-Cola HQ now features a giant flip-disc display wall. Every ten minutes, the wall discs flip to display a different brand graphic. The creation of this design element was a way to utilize a timeless technology (railway station flip board) to showcase the space, not overwhelm it. Another way the design integrated features to provide an element of surprise was installing flags from every market they are engaged in. Anyone walking through space can find the flag from where they are from or where the company does business. Justin reiterated that WeWork strives to tie branding and community together in a purposeful way in each of their facilities as well. Making sure each facility’s design reflects the locale is part of what fosters the sense of location within each community. Injecting local flavor, graphics, and imagery make each WeWork facility grounded in their immediate location and neighborhood. Here is a view of the Atlanta space. Image courtesy of WeWork. Justin reiterated that WeWork strives to tie branding and community together in a purposeful way in their facilities as well. Making sure each facility design reflects the locale is part of what fosters the sense of location within each community. Lawrence added that additional consideration of the co-working model allows space to be scaled easily for smaller companies and provide other areas for large groups, which need space but not confining them to extended lease terms. For startups of two or three people, co-working space is ideal. Growing companies who decide to move out of the co-working ecosystem, pushes things to a more traditional trajectory for space acquisition. Managing the risk to take on space via co-working alternatives is an option that did not previously exist. At WeWork, smaller companies can personalize as they see fit – if they are in an enclosed dedicated area. The glass walls provide the perimeter that defines each company, yet the interaction and visibility to others sharing the facility open the possibility of idea exchange that supports the small entrepreneur, and the new ideas that the small entrepreneur can bring to the more great enterprise members. Melissa added, in this “sharing economy,” supported by co-working spaces like WeWork, there is flexibility to grow, get venture funding or access to intellectual property among the participants in the community. The value of the space and being together in the space is where all the pieces can come together. The opportunity for large companies opening their “front doors” through co-working experiences breaks down the boundaries of their traditional offices and embraces the broader community. Leveraging the ability of co-working facilities that add services allows traditional organizations to utilize those locations to change up their portfolio with different kinds of workplaces. Sharing co-working spaces give all business the opportunity to share and learn from each other to broaden their reach to people they may not encounter in the usual venues they operate. Janet related what her firm is discovering through the process of thinking about how to re-shape their space. My talking to people within her company, and how they have those discussions with clients has shown that there is power in asking the right question up front. That exercise may facilitate and decipher what are the fundamental problems to solve with new designs and workplace strategies. For example, items like – Were you as successful as you wanted to be in the last five years? Where do you want to go in the next five years? What kind of talent do you want and need? What do you need to provide for the talent you already have and the people you want to have in your organization? The answers may dictate anything from choice of location to type of space and even affect kind of future workers that the company is seeking for inclusion in their workforce. There is no one answer, and you cannot provide everything. Janet went on to note that putting the scenarios together for a new workspace can be akin to planning a dinner party. How you put it together matters and will translate into providing a way to analyze information needed to prepare, and the research to get to a simple solution. The discussion segued into whether the physical workspace design/atmosphere was more important than compensation for employees. From the perspective of studies that evaluate what employees value most, Melissa pointed out that employees rank the five elements that connect people to their work ahead of compensation. Those items include having friends at work, a sense of control, ability to impact the outcome, ability to solve hard problems, and to make a difference or have a positive impact on the world. Having these elements supersede the importance of salary. All of these pieces make companies cohesive. The environment enables most of the above aspects workplace satisfaction. Only one in five people ranked compensation as the top element. The conclusion for the moment was that a person that follows the paycheck would follow the money. Wendy followed with the notion, that if you are working to attract talent, engaging, developing and keeping talent is all about how you manage four out of five of the elements and to make sure you provide space for who will be a good community member in your organization. The event rounded out with a few questions from the audience. Lawrence described the changes at Cushman’s Atlanta offices after a recent change. There was a 40 percent space reduction and move to open bench type workstations that replaced more traditional cubicles with high panels. The intended consequence – more sharing and conversation has helped in diversifying teams. Having beer on tap has pushed different service lines to get together on an ongoing, informal basis. They had to work harder to encourage people to adopt the more open spaces for a touchdown and hosting more meetings in those areas as well. They also had to let people know it was OK for them to use those areas, which did not exist in the former location. Wendy noted that Coca-Cola is starting to globally implement what they learned in the refresh of the Atlanta office. Work behaviors are the same; human needs are the same: everyone needs a chance to focus, refresh and collaborate, but those are new concepts for some people, and the spaces for those activities are changing as well. Justin stated that WeWork’s growth and the increased acceptance of shared space have been incredible, they are pushing the envelope as people are not going to go back to what used to be the norm. Janet’s commented on the approach to design, process, and function now are centered on the human experience focused on how designers can better determine what the expectations for workspace may be and how design can contribute positively to meet those expectations. Successfully doing that will most positively affect a company’s bottom line. At tvs design, the goal is to work with the client to find the information that will result in the best solution for their clients. According to Lawrence, technology is driving the changes in the corporate real estate world. The industry is changing. It’s all about data; value-add not just providing space for X number of people in X number of square feet. Brokers are not just reiterating what vacancies are available and making the deals. The business model is changing; the market is changing. There are lots of opportunities for partnerships to embrace the changes and provide full-service real estate solutions. We wrapped up with Melissa’s comments about how business change over time and that there has been a shift in thinking about how architecture, and operations are dynamic. Better design helps increase productivity and the models being established by WeWork is informing the industry as well. Attendees mingle at the Atlanta event. Image courtesy of Savills Studley and Patrick Ward. We are continuing the conversation in the last of our series in Toronto, Canada on November 14th. Join us! The abuse these immigrants endure is similar to what our two journalists dealt with the night they were arrested and taken from their homes without due process. This story goes down in history and brings to mind the difficulties of bigotry and segregation.